I do believe I have developed a legitimate book addiction. I have always been able to walk into a Target, poke around looking at stuff, and walk out without purchasing a thing; however, lately I cannot walk past a bookstore without going in. Nor can I resist buying a book before leaving that bookstore. Today I wandered around a few small towns in Mass. I’m a nomad and live wherever; wandering is my thing. I have some bookstores in Boston on my list to check out, but that will happen another day. Today I was scoping out bookstores in Acton, Sudbury, and Concord. I will do book signing events in this area in the Fall with the release of Echoes of War, so I was poking around the bookstores to scope out prospects. I went into three different stores and returned to my friends’ house with four books. That is on top of the four other print books I already have in my “To Be Read” queue. We won’t even talk about the number of books on my eReader in the electronic “To Be Read” queue. It’s a little embarrassing at this point–and I probably shouldn’t mention the eBook I just added to my Kindle wish list. Oh well. Two of the stores I went to today carried current books, the third was an antiquarian shop that I still visited because, well, it is still a bookstore and my wee addiction brought me there. When I was roaming Portland, Maine a few weeks back I went into a bookstore there called PRINT: A Bookstore. I absolutely adored this shop, and the people there were very friendly. I happened to be staying at a great little AirBNB just up the street from it, so I stopped in there a few times and only managed to buy two books–just two! The image above is of one of the books I grabbed when in Portland that is a collection of SciFi and Fantasy short stories. I tend to avoid short stories because I always feel like I get sucked in, the story ends too quickly, and I end up feeling ripped off and annoyed. None of the stories in this collection have done that to me. I’m a bit over halfway through the book, and each story thus far has been extremely well written and ends with a resolution that leaves me satisfied, not irritated. One story had me laughing out loud in public earlier this week when I was reading while loitering in a lobby. 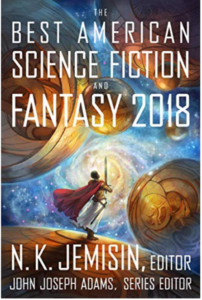 This collection gets more bonus points just by having N. K. Jemisin’s name on it. Icing on the cake! After devouring her Broken Earth Trilogy, I’m inclined to buy anything with her name on it. Here’s my confession: I’ve always been a bit intimidated to try to write a short story. My early attempts at it many years ago resulted in stories that absolutely suuuuuuuuucked. They ended up in the trash too. My shortest novel thus far is 90K words. I’m a bit long-winded. Could I really compress what I have to say into something closer to 10K or even 20K words? I have had my doubts for years now. After reading the ones in this collection, I have the proof that not only can short stories be fun and fulfilling reads, but maybe I could pull it off. I have a SciFi trilogy to finish first, but I have tucked this little nugget into the back of my mind for now. Who knows what could happen next? It’s those little nuggets that turn into a five-book fantasy series or a SciFi trilogy!